How a third party asking the press regulator to rectify false facts (related to the MC case) watches communication swiftly shutting down before it even had a chance to begin. In the acronym "IPSO", "I" stands for Independent, which is the main feature in the description that this Press Standards Organisation gives of itself. IPSO even claims to be completely independent as if some kind of reliance might be suspected. Established in September 2014, IPSO is responsible for regulating a large part of the news industry in the UK and making sure that its members follow the Editor's Code of Practice. In case of a complaint about printed or online matter breaching the code, IPSO is expected to investigate and potentially make the press publish corrections in order to uphold the highest possible standards of journalism. Among its prerogatives concerning the Editors' Code, IPSO acts as a watchdog of inaccuracy, the first item in the cornerstone of the system of voluntary self-regulation to which they (the press members subscribing to IPSO) have made a binding contractual commitment. It likely does it sometimes, but not always. The reason why the press happen to print fake facts and get away with it remains subject to speculation. However it is tempting to relate it to an incomplete independence. - 65% of respondents believe that "the others" live in their own internet bubble, mainly seeking opinions similar to their own - but only 34% admit to living in their own bubble. - 63% are sure they can identify fakenews - but only 41% think that an average person is capable of doing so. -58% believe they are better able to spot fakenews than a typical person, compared to only 28% who do not agree. - 60% think that "the others" do not care anymore about the facts and simply believe what they want to believe. - 59% believe they better understand social realities such as immigration levels and crime rates than an average person, vs. 29% who think this is not the case. In the following narrative IPSO proved that accuracy is not its priority when facts are at stake. The issue is overall what happens to facts in a post-truth era less interested in allowing the public to form their own opinion than in appealing to emotion and belief. Facts tend to become alternative facts. Of course I don’t think that the journalist at the origin of that "ipsodisseia" (Nick Pisa) made up from scratch the false facts mentioned below (in France, we call it “infox”), a source provided them for some reason, but fact checking was his prerogative and his responsibility. 1 – On September 17, 2018, The Sun published an article headlined MADDIE HUNT CRISIS, Fund to find Madeleine could be wiped out if McCanns lose £750k case against cop who claimed they were responsible for daughter’s death. 1. 1 The MCs were fighting to avoid paying £750K to the ex-detective. The MCs sued GA et al with a double intention, one to request the withdrawal from sale of GA's book The truth on the lie and the other to obtain a compensation for the damages caused by that the book and the documentary inspired by it, to the 5 members of the MC nuclear family. Each of both actions went all the way to the Portuguese Supreme Court of Justice (STJ) . The MCs failed to prove their case and were ordered to pay Gonçalo Amaral's and his co-defendants' costs. Ipso facto there is no way they can fight against that or avoid paying it. Their plea of nullity concerning the STJ's ruling was their final appeal, it is over and they must pay whatever the costs amounted to. 1.2 (after stating that the MC lawyers had lodged final paperwork at the ECHR) : If the European Court rules against them, the trustees will decide on how best to make any payments. Applying to the ECHR doesn't stop people having to pay what they owe to the domestic courts. Winning or losing at the ECHR doesn't affect those payments at all. If the MCs applied to the Court, if their application against Portugal is declared admissible, the ECHR will decide whether Portugal has violated or not the MCs' fundamental human rights. 1.3 The 2015 libel case won by the McCanns was later overturned and Amaral was awarded compensation. There is no mention of any compensation awarded to GA in the rulings of neither the Appeal Court nor the STJ. Besides he didn't ask for one. According to Paulo Reis' Gazeta digital blog, GA said he would file a formal complaint with IPSO against the newspapers that printed the same false news. It seems that he finally didn't. 2.1 Kate and Gerry McCann are currently challenging Gonçalo Amaral at the European Court of Human Rights in Strasbourg to stop him from cashing in. Every citizen (including tabloid journalists) of the 47 member States of the Council of Europe (28 of which are members of the EU) would or should know that applications lodged with the ECHR are exclusively against one of the 47 member States for non-respect of one or more human rights. 2.2 Amaral’s earnings from the book are revealed in documents filed at the ECHR. GA's earnings from the book etc. were part of the first instance lawsuit, launched by the MCs. It was public, started in September 2013 and reported on line. Whoever reads the rulings reckons that it is not true. 2.4 Sources close to the family also fear Brexit may have an impact — with judges taking “vengeance” over Britain leaving the EU by ruling against them. Any journalist is expected to avoid reproducing a suggestion, even coming from "sources close to the family", that reveals, to say the least, a singular ignorance of the European institutions. He should, for the best information of the public, have observed that the ECHR isn't a EU Court, but a supranational court established by The Convention for the Protection of Human Rights and Fundamental Freedoms to ensure its application. On November 5, 2018 I emailed The Sun deliberately on a minor point, arguing it was not reasonable to disinform the public stating that individuals lodge complaints against individuals at the ECHR, whereas complaints can only be lodged against a member State of the Council of Europe for breaching one or more of a citizen’s rights and guarantees. And asking "please do rectify !" The same day, I got a robotic reply (signed "Ben"), frivolous and patronising, thanking me for contacting... appreciating all feedback... ensuring that this is passed on to the relevant department for me and finally hoping I have a great rest of my day and, if requiring any further assistance, please not to hesitate in contacting (Ben), or anyone here at The Sun, the will be happy to help. I would have been surprised had the Sun replied something like "we are never wrong when we admit we were wrong". Still on November 5, 2018 I emailed IPSO, attaching my email to The Sun and their reply. If you have submitted a formal complaint and we decide that your complaint does not raise a possible breach of the Editors’ Code, we will write to you to explain why and send a copy of your complaint, including your name and any contact details you have provided, and our letter, to the publication. · any other correspondence you have sent to us. This will provide the publication with the opportunity to resolve your complaint directly with you through its own complaints procedure, if you have not already contacted them. Applications with the ECHR aren't lodged against individuals but against States. Gonçalo Amaral wasn't granted a compensation by the Portuguese Court of Appeal and the Supreme Court. The ECHR is an institution of the Council of Europe, not of the EU, which has its proper court of justice (the EJC). On November 23, 2018 IPSO replied (with copy to The Sun) that they had read my complaint carefully, and had decided that it does not raise a possible breach of the Editors’ Code. You said that the article breached Clause 1 (Accuracy) because it gave the misleading impression that the McCanns had issued proceedings against Mr Amaral at the ECHR. You said that this was inaccurate because claimants can only issue proceedings against member states, not individuals. The article did not report that Mr Amaral was a party to these proceedings, but reported that these proceedings were part of the McCann’s ongoing legal battle with Amaral, relating to the libel case arising from claims made in Mr Amaral’s book. Where the ECHR case relates directly to this libel issue, it was not misleading for the article to refer to him in relation to these proceedings. The article did not give the inaccurate or misleading impression that you suggested. There was no possible breach of Clause 1 on this point. You also said that the article breached Clause 1 (Accuracy) because it gave the misleading impression that the case was connected to the EU, and will be heard at the ECJ. However, the article expressly stated that the case will be heard at the European Court of Human Rights. The statement that “sources close to the family also fear Brexit may have an impact”, was clearly presented as speculation from people close to the McCann’s, and it's (sic) inclusion in the article did not render it inaccurate or misleading under the terms of Clause 1. I was entitled to request that the Executive’s decision to reject my complaint be reviewed by IPSO’s Complaints Committee... I had to set out in the next seven days the reasons why I believed the decision should be reviewed. It is well known that sophisms' goal is not to get closer to the truth using rigor and method, but to win in a discussion, intimidating. I could have pinpointed that the McCann's legal battle with Amaral (et al), which wasn't a libel case but aimed to obtain compensation for damages, was not ongoing but over and that the costs had to be paid by the losers, whether or not they lodged an application with the ECHR, this Court being not a ultimate Court of Appeal, but having the one and only mission to ensure compliance with the commitments entered into by the signatory States of the European Convention on Human Rights. I could have underlined also that, though the real loser in the first instance of the mentioned lawsuit was precisely the main victim of May 3 2007 events in Praia da Luz, Madeleine, whose localisation is still uncertain, no appeal was made by her parents on her behalf. Finally I could have noted that arguing that "the speculation came from people close to the MCs" wouldn't work in a libel case, as newspapers are not expected to spread opinions that are refuted by facts. Remarkably the most significant and verifiably false fact, the second point, had been ignored, which perhaps confirmed a certain embarrassment. Where, when and by whom was that decision of award made ? And why, if the MCs had been condemned to pay GA such a compensation (which they were not), would they go to the ECHR to avoid paying it ? On November 28, 2018 and with more curiosity than hope, I asked for a review, dropping the two minor points and concentrating on the "compensation" allegedly awarded to Gonçalo Amaral, one of the defendants. As I am now solliciting IPSO’s Complaints Committee to review the complaint rejected by the Executive’s decision, may I beforehand observe that discriminating between information and dis-information (I am deliberately not using the expression "fake news" since I don't know whether the Sun intended to mislead) is not an easy task for the public ? I will restrict my remarks to one important point that IPSO's reply for some reason omitted (point 2 of my original complaint). - The Sun (17.09.2018), in an article headlined "Fund to find Madeline could be wiped out if McCanns lose £750k case against cop who claimed they were responsible for daughter’s death", said The McCanns are fighting to avoid paying £750,000 to the ex-detective who shamefully claimed they were responsible for (Madeleine Mccann's) death. - The Sun (04.11.2018), in an article headlined “'POISONOUS LIAR' Top cop who taunted Kate and Gerry has made nearly £350k from Maddie McCann in book and DVD deals" said that They (the MCs) won the case in 2015 but the ruling was overturned on appeal — a decision upheld by Portugal’s Supreme Court. Amaral was awarded compensation. - The first article above said explicitly what that "awarded compensation" was : The latest figures show £728,508 is in Madeleine’s Fund: Leaving No Stone Unturned — mostly from public donations. That could all go if the decision to award Amaral £430,000 is upheld — with the McCanns paying costs on top. The information in that article seems to be that Amaral was awarded compensation of £430,000 and the McCanns were ordered to pay court costs also. Altogether the sum they have to pay is £750,000. 1. Could The Sun reveal which Court exactly awarded Amaral compensation of £430,000 and when? 2. Could The Sun explain where the figure of £320,000 costs came from? If The Sun cannot verify those figures then I am afraid their articles cannot be shown to be accurate, which is a requirement of the Editor's Code of Practice. 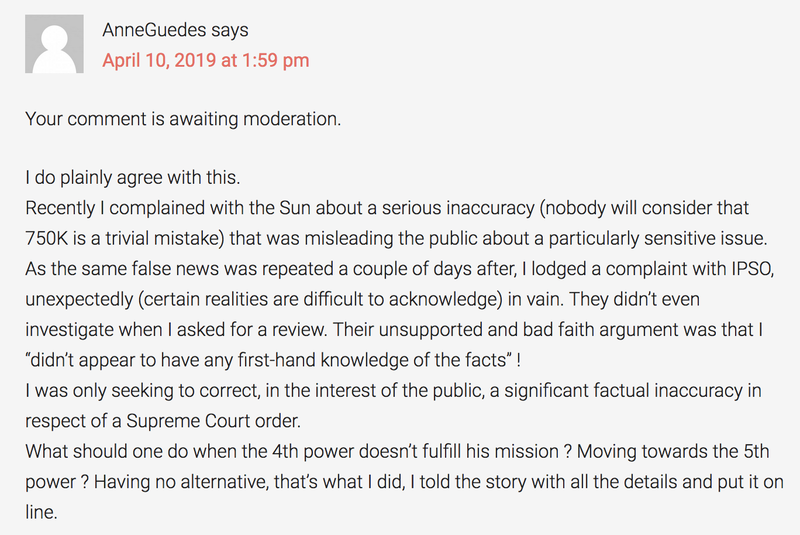 It would have been more simple to question The Sun than to read the translations of the Appeal Court and Supreme Court rulings. 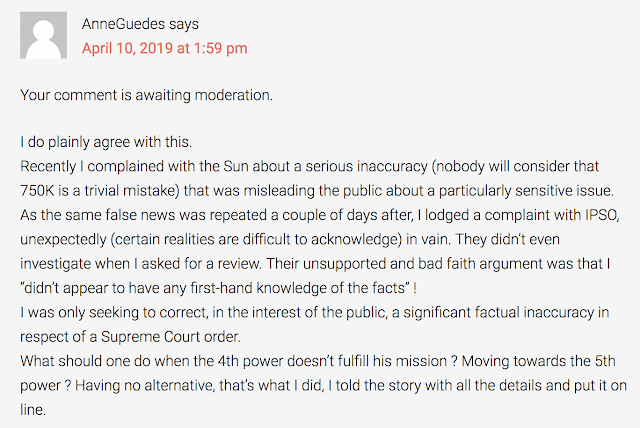 But IPSO took none of those options, they opposed an automatic plea in bar, showing preference for protecting The Sun from adverse findings rather than protecting the public from disinformation. I admit that the Sun's articles might (erroneously) call "compensation awarded to GA" the high rate interests for the freezing of assets requested by the plaintiffs and carried out by a court order. In any case this has nothing to do with the rulings of Appeal and Supreme Courts. The Committee revised the Executive’s decision and agreed that you are a third party to any alleged inaccuracy: you do not appear to have any first-hand knowledge of the facts of the case, and as such it would be inappropriate and impractical for IPSO to undertake any investigation without the consent and involvement of those involved. For this reason, the Committee declined to re-open your complaint. This reasoning also applied to the article headlined “"Fund to find Madeline could be wiped out if McCanns lose £750k case against cop who claimed they were responsible for daughter’s death", which you referred to in your email requesting a review. For this reason, and the reasons already provided by IPSO’s Executive, the Committee decided that your complaint did not raise a possible breach of the Code. As such, it declined to re-open your complaint. I emailed IPSO on the same day, observing I was amazed by the argument of “my not having any first hand knowledge of the facts of the case” and wondering what first hand knowledge the Sun journalist had and why the rulings, available on line and in English, were not enough for the Committee to check the facts. IPSO is now four years old. Has it lived up to its promises? Has IPSO raised press standards from their pre-Leveson levels? The Independent Press Standards Organisation (IPSO) is a body established by the large newspaper groups. Calling itself a “regulator”, it has in fact never carried out any actual regulation – not a single investigation or fine in more than three years. Instead it represents the interests of the largest newspaper publishers; joining them in lobbying to resist reform, and giving them the perception of being regulated. It will consider complaints from the public, but only on limited grounds, often on an irrational basis, and without providing fair remedy when the newspaper is in the wrong. On December 15, 2018 I contacted Hacked Off just to add grist to the mill. They were sorry to hear what happened (they are always, but when they know the details, usually they are sorry for themselves !) and curious.. I objected a possible conflict of interests, as Gerald MC flirted with HO, and summarized the "compensation award" point. They wanted the articles' links and the Court rulings. I was delighted to send them the last links, did they even know they existed ? Given that the Editors' Code of Practice Committee often considers suggestions for amendments from the public or civil society, and in order to clarify the rules, I'd like to better understand the limits of a third party's intervention under clause 1 (accuracy). De facto I found myself in the situation of alerting straight away to a newspaper, The Sun, on a patent, verifiably false and easy to correct factual inaccuracy that would mislead readers about a sensitive case. In vain.I was careful not to question whether the news was intentionally false or not created with the intention of causing harm, as this was beyond the scope. Therefore and as “anyone can complain under clause 1 (accuracy) of the Editors’ Code about a significant inaccuracy which has been published on a general point of fact”, I immediately emailed a complaint to IPSO. Among my three points, IPSO's Executive ignored one and considered that two "did not raise a possible breach of the Editors' Code”. I requested a review of the ignored point, the most serious and significant (actually an erroneous fact). The articles in question affirmed that "the plaintiffs won a case but it was later overturned and the defendant was awarded compensation”. Neither the Appeal Court ruling that overturned the first decision nor the Supreme Court that confirmed the Appeal Court granted compensation to the defendant. I can’t but protest against the unsubstantiated argument of “not appearing to have any first-hand knowledge of the facts”, as I translated in English both documents mentioned above and available online. Should I understand that only the individuals most closely affected can bring an accuracy complaint ? If this is true, where is it stated ? While the views of the person(s) concerned should be taken into account, I find no explicit requirement to do so and in any case a requirement to take these views into account does not mean these views would be decisive. I was only seeking to correct, in the interest of the public, a quite significant factual inaccuracy in respect of Court orders (and nobody will consider that 750K (with costs) is a trivial mistake). At this point should I certify that I have no affiliation or relationship with the persons mentioned in the articles in question ? As you may be aware the Editors’ Code of Practice Committee draws up the Code but it is administered by IPSO under the rules that it sets for considering complaints. The point that you raise seems to fall within IPSO’s remit and so it is really a matter for you to discuss with that organisation. Which comes first, the chicken or the egg ? On the same day the annual report on the UK’s system of independent press regulation by the Press Recognition Panel (PRP) was published. The report reckons that IPSO never has sought any recognition or assessment by the PRP of its work, but observes, “based on limited publicly available information, that this organism does not come close to meeting all the Charter criteria, which means the public is not fully protected in the way that Sir Brian Leveson intended”. The report also states that under criterion 12 of the Charter, decisions on complaints should be the ultimate responsibility of the Board. In IPSO’s case, decisions on complaints are made by IPSO’s Complaints Committee, not its Board. What would Sir Brian Leveson say of “victims” invited at the Inquiry who complain butterly about the press, but not about false stories, only on those they don’t like ? In 1984, George Orwell not only describes a totalitarian system brought to fruition, he features a nightmarish world in which the imagination itself disappears, for lack of distinction between the true and the false, the fact and the fiction. Facts in themselves are not true. They simply are. The real is always right. In post-truth era opinions disconnected from reality tend to be considered as facts. This questions the very possibility of communication in a common world. The erasure of truth as norm affects relationships between individuals, not only on the topic of rationality, but also in sensitive exchange. Et comme on ne s'arrête jamais..